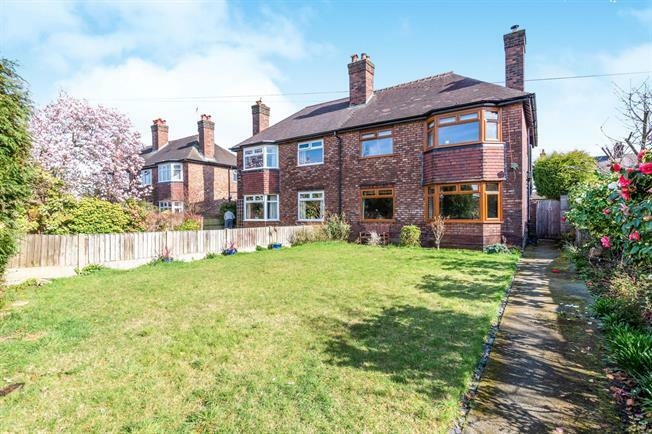 4 Bedroom Semi Detached House For Sale in Warrington for Asking Price £475,000. Internal inspection of Vicarage Walk is imperative to appreciate the size and potential throughout. This property benefits from larger than average bedrooms and is located in an enviable position, tucked away on a quiet street yet just minutes walk from Stockton Heath Village. In brief the accommodation comprises a spacious entrance hallway with downstairs WC, an open plan living room with a feature multi-fuel burner and solid oak flooring throughout, a generous dining area leads onto the kitchen with integrated appliances and French doors out onto the extensive private rear garden. Upstairs boasts four double bedrooms, one of which with a newly fitted en-suite as well as a great size three piece family bathroom. Externally the property benefits from fantastic sized private gardens to the front and rear with a decked seating area, external lighting and access to the single garage, there is also off road parking for three vehicles.